Joint statement from Dennis Martire, LIUNA Mid-Atlantic Vice President and Regional Manager, and Philip Ameris, Business Manager of the Western Pennsylvania Laborers’ District Council, on Pittsburgh Mayor Bill Peduto’s historic signing of two executive orders for the city’s construction industry. Ameris: It was an honor standing next to Mayor Peduto and his staff as they emphasized the importance of the trade unions in fulfilling their goals for Pittsburgh’s construction future. The executive order on project labor agreements (PLAs) is the first of its kind for the city. For the first time, a widespread PLA program will apply to all city-managed projects with a minimum cost of $500,000 and includes a high minority worker requirement that the Mayor’s staff hopes to reach and exceed. By establishing these PLA standards rather than individual agreements, PLAs are becoming a rule, not a rarity. This PLA order goes hand-in-hand with his second order on workforce development. With the time and resources that go into training a skilled, reliable workforce, local residents deserve high wages and good benefits that are ensured in PLAs. Mayor Peduto simply wants what is best for the city, and I look forward to working with him and his staff to bring more Pittsburgh residents into the trade unions and improve the lives of local residents with family-supporting jobs in the process. Martire: Pittsburgh is one of those cities with a rich history, and future generations will look back on Peduto’s two executive orders knowing that it is these orders that allowed the city to achieve its full potential in the construction boom. 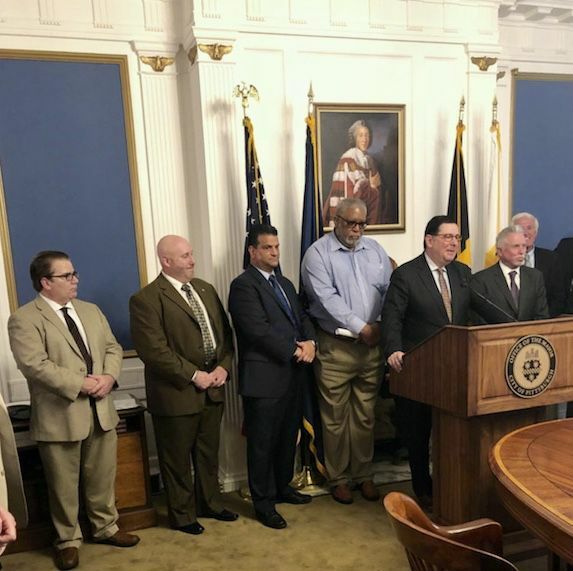 As Mayor Peduto emphasized, the economic benefits of the boom should be felt by everyone, and with these executive orders, Pittsburgh is making that happen. He acknowledged how Pittsburgh has gone through times where jobs were hard to find and construction was limited, but that is not what is happening today. Now, there’s more construction projects than there are skilled workers in Pittsburgh. Unfortunately, this is a problem that goes beyond Pittsburgh and impacts the entire country. The industry is in need of skilled workers, and Pittsburgh’s trade unions are a key part to the solution. LIUNA training centers and the LIUNA apprenticeship program take eager local residents interested in joining the trade, even if they have no experience, and turn them into skilled workers with opportunities to advance in the industry. I hope that other political leaders look to Mayor Peduto as an example and start establishing similar workforce programs with trade unions for the betterment of the working people they represent. The Laborers’ International Union of North America (LIUNA) Mid-Atlantic Region represents more than 40,000 working men and women predominantly in the construction industry in Pennsylvania, Maryland, West Virginia, the District of Columbia, Virginia and North Carolina.